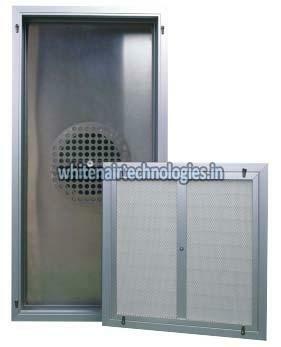 From Telangana (India), we are the Ducted Filter Modules Manufacturer and Supplier, worthy a mention. The offered Ducted Filter Modules/ Hoded filter Modules are in complete synonymy with the illustrated industry standards. Moreover, we offer them in ample stipulations and models to gratify variegated needs. Priced reasonably, these Ducted Filter Modules are attainable in bulk as well! Our Filter Modules include a 300 mm (12")x 300mm(12") collar for attachment to an Air Handling Unit(AHU) which determines flow rate. Internal Baffling system and diffuser plates ensure uniform face velocity.